Shih Li-Jen, senior curator and art agent, founded Modern Art Gallery in 1982. Through the years the gallery earned its reputation from promoting modern Chinese art and introducing the international famous artists and their works into Asia. In October 2008, there is a Gallery focusing on contemporary Asian and Chinese artist established in Beijing under the same concept. 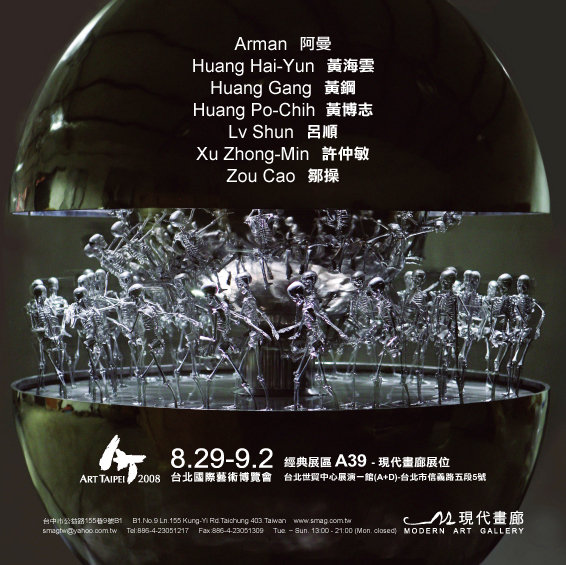 In this years Art Taipei 2008, Modern Art Gallery will present the artworks by six outstanding artists: Arman, Huang Hai-Yun, Huang Gang, L v Shun, Xu Zhong-Min, Zou Cao etc. The work DHL by Arman is an enormous sculpture that is 3.6 m high. The composed artwork , The Sun also Rises III by Taiwanese artist Huang Hai-Yun is expressive and unrestrained. Huang Gang's When the Wind is Rising is by far the greatest work of his. Through the techniques of multiple Collage on a patchwork outer vestment worn by a Buddhist monk, the historical and modern signs are juxtaposed together and the profound meaning is re-awaken by artist's handcraft. L v Shun's The Sound of Nature glitters with the eye-dazzling colours, and The Vanishing City displays multiplicate levels of tones, both of them are excellent and exceptional works. Xu Zhong-Min's mechanical dynamic installation creates powerful visual effects for the audiences to experience an ultimate sensation. The doctor of philosophy, Zou Cao appropriates the classic artwork Marilyn Monroe by Andy Warhol and remodifies with fingerprints, presenting a profound connotation. From classics to contemporary, Modern Art Gallery presents the audiences astonishing contemporary artworks with a brand-new vision.